As the deep state continues to push the Russian election interference narrative—with no concrete evidence—the damage to US-Russia relations continues to grow. Sadly, those who continue to buy the Russiagate conspiracy theory have forgotten the US government’s history when it comes to propaganda used to start wars and bolster the military-industrial complex. A recent revelation from the newly released JFK Files can now help put this entire Russian hacking scenario into context—as it has been the subject of previous propaganda campaigns. On March 22, 1962, a meeting, held by the “Special Group (Augmented),” which according to an encyclopedia on the Central Intelligence Agency, included Attorney General Robert Kennedy, CIA Director John McCone, National Security Advisor McGeorge Bundy and chairman of the Joint Chiefs of Staff Lyman Lemnitzer, discussed the creation of a false flag attack on the United States to be blamed on the Soviets. According to the documents, the US government wanted to manufacture or obtain Soviet aircraft so they could launch an attack on America or friendly bases and use those attacks as a pretext for war. As the Daily Caller notes, the notion of using fake Soviet aircraft in a so-called “false flag” attack was first revealed in Robert Dallek’s “An Unfinished Life: John F. Kennedy, 1917-1963,” which was released in 2001. Dallek’s book says that the idea to manufacture or obtain Soviet aircraft was suggested by CIA Director McCone, however, the released documents say it was raised by Attorney General Kennedy. As people continue to believe the warmongering rhetoric from the state, they also continue to forget America’s history of lying to the people to get them to accept war. Indeed, the JFK files have now given us at least two incidents of the United States planning false flag attacks against its own people as a pretext to wage war. As TFTP reported last month, the JFK files also reveal the plans for another false flag attack to be blamed on Cuba. 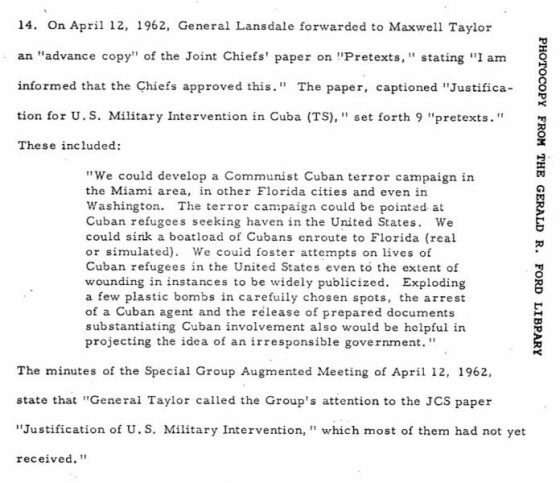 In the document which was marked TS for Top Secret, the US military revealed its plans to trick Americans into war with Cuba. The plans were to create and carry out false flag terror attacks against American citizens and use them as propaganda to gain support for the war against Fidel Castro. In the documents, officials noted that the plans for the attacks were “approved” and the Joint Chiefs merely needed to pick one of the nine “pretexts” to use to trick US citizens into war. The plans involved killing innocent people and injuring others and making sure these instances would be “widely publicized” as propaganda to start an unjust war. “We could develop a Communist Cuban terror campaign in the Miami area, in other Florida cities and even in Washington. The terror campaign could be pointed at Cuban refugees seeking haven in the United States. We could sink a boatload of Cubans enroute to Florida (real or simulated),” the document reads. Notice how callous these monsters sound when talking about drowning a boatload of Cubans—which would have likely contained innocent children—to start a bogus war for profit. When reading the above documents, one should be naturally inclined to begin questioning every single war America has ever entered. It becomes perfectly clear that the US government cares not about deceiving its own citizens and killing innocent people so they can send our brothers, sisters, mothers, and fathers off to other countries to die so the fat cats in DC can bolster their war portfolios on Wall Street.